Rights & Democracy is announcing its member-endorsed candidates for 2018! A Rights & Democracy endorsement is a signal that a candidate is already a community leader on the issues that reflect RAD’s values and will champion those causes in the Legislature. A RAD endorsement comes with the expectation that elected candidates will work with RAD members on legislation of shared interest to their community. In that way, it’s more than just an election year activity—it’s the start (or continuation) of a working relationship. RAD contacted all declared candidates to alert them to our endorsement process and how they could apply for an endorsement. First, they had to fill out a questionnaire and their responses were reviewed by RAD’s Movement Politics Committee. The Committee then forwarded the names of candidates to voting members. In the coming weeks, RAD will send out more information on how to get involved in the campaigns of these candidates—either to donate money, canvass in their districts, organize events, register voters, and all that is needed to help them win their primary (if they have one) or in November. Last month, Rights & Democracy’s Board of Directors endorsed a slate of more than 20 candidates who had either previously been endorsed by RAD, or have been proven legislative champions—especially on paid family leave, raising the minimum wage, and other top issues. Here is the list of the RAD member-endorsed candidates, so get out there and vote for them on Tuesday, August 14th in the primary! And then again in November! 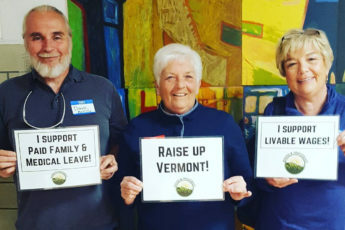 In the coming weeks, RAD members will be asked to work this campaign season to help build a veto-proof majority of candidates who will be willing to lead on the issues that matter to Vermonters – raising the minimum wage, passing paid family leave, and ensuring that our state is equitable for all. Show a commitment to RAD through consistent engagement in committees or other activities.